Last year PBB investigated several potential solutions to reduce waste from composite boatbuilding and to dispose of the pile of unwanted used composite boats. Those included developments in carbon fiber recycling, and the introduction of materials like thermoplastic resins, which are easier to recycle than thermosets (see “The Unresolved Afterlife of Composite-Built Boats,” PBB No. 163). 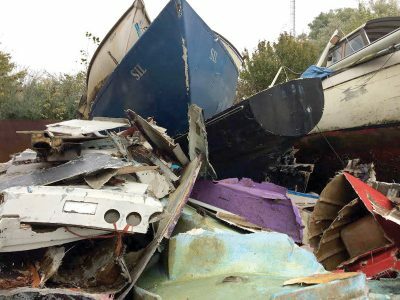 Though promising for the future of boat manufacturing, many of these methods don’t actually address the current pile of dead boats and composites manufacturing waste. An exception is the work of Dennis Nixon and Evan Ridley of Rhode Island Sea Grant. They’ve been looking to emulate the European wind industry’s method for getting rid of its composite waste: sending it to cement factories to burn as fuel. After the waste is burned in the kiln, leftover ash is mixed into new cement. That mixture doesn’t degrade the cement, which happens when you mix ground-down composites into new cement. In a recent phone conversation, Ridley said they were making progress in developing this recycling program. Most recently, he sent samples of hull and deck sourced from an old Cape Dory 22, courtesy of Bristol Marine in Bristol, Rhode Island, and virgin hull molding scrap from USWatercraft in Warren, Rhode Island (see “On Hallowed Ground,” PBB No. 147), to Geocycle; a subsidiary of the cement manufacturer Holcim, it provides waste-derived fuel for the company’s cement plants. In an effort to recycle “dead” fiberglass boats, the Rhode Island Sea Grant program is hoping to partner with com­panies like Geocycle, a subsidiary of Holcim, that burn industrial waste for energy. Geocycle’s testing of the samples will help determine how well the old boats will work in the process, to establish a value for the waste. Once that value is proved, the next step is to find a waste-management company to break down old boats and transport them to the factories. Funding, said Ridley, could come from an increase in the state’s biannual boater-registration fees of between $2 and $5. Another challenge the program faces is motivating boat owners to properly dispose of their old boats. Ridley said there could be lessons learned from state vessel-disposal programs already in place in California, Oregon, and Washington. Those programs still send their old boats to the landfill, he pointed out, mainly because they’re in bigger states that have space in their landfills, which is scarce in Rhode Island. However, if Rhode Island Sea Grant can create a viable boat-recycling program, it can share its methods with other Sea Grant college programs through its national communications network and at yearly conferences.